Evgeni Malkin is this year's clear favorite to win the Hart Trophy. While it is yet unknown if he is indeed the winner, Malkin has collected his first individual award of the year at a ceremony in Moscow on Thursday. The Pittsburgh forward won this year's Kharlamov Trophy - an NHL award given to the most valuable Russian NHL player, named after Valeri Kharlamov. The Trophy was established by Sovetsky Sport in 2002. Malkin was presented with the award by Kharlamov's son, Alexander, who said that is was clear that Malkin without a doubt the best hockey player in the world this season. 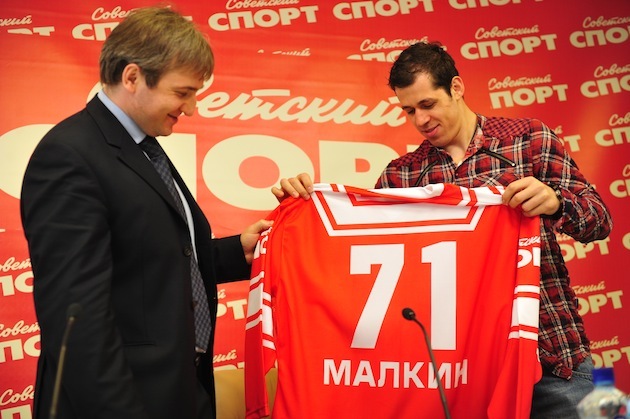 Malkin himself was humbled by the award and said: "This is very special to me. This is especially because it is voted by my fellow Russian players. It's special when your teammates and friends, who are sometimes your enemies and foes on the ice, give you the honor of being named the best." Afterwards he played tribute to his favorite player in the NHL — Pavel Datsyuk. "He is unique," Malkin said. The ceremony was also attending by a few Pittsburgh fans, who have been following the Penguins since 1989 presented Malkin with a picture that was taken in the locker room after the Russians won the World Championships. On the back of it they wrote a message to Malkin Also wishing him to be playing only in the Pittsburgh uniform in April and May every year in the NHL playoffs. As for the national team, they said it's time for the younger players to be called up "and Alex Ovechkin." Even Russian Pens fans don't want Ovechkin in the playoffs. Malkin said winning his first World Championship title was very special and that he still wants to play for the national team no matter when. Q. After the game against Italy at the Worlds, some Italian players approached you and asked to take pictures with you. Had this ever happened before? MALKIN: "I was really surprised. It was the first time players from the opposing team asked me to pose for pictures with them. It was really unexpected! But they didn't send me any copies." When you won the Cup with Pittsburgh you met with President Obama. After winning the World Championships you met with Vladimir Putin. In your opinion, who is more interested in hockey of the two? "I'd have to say Putin. Obama is more into basketball: playing it, being a fan of the game. When we went to the White House it was all very official. We were lined up, Obama came to greet us, and that was pretty much it. With Putin it was a lot closer, more comfortable. It was very informal: we talked, had a few conversations. Putin follows hockey very closely. He plays hockey. I think he understand hockey a lot better than Obama." Can the Devils save the series against the Los Angeles Kings? "Nothing's impossible. But in hockey when you're down 3:0 [the interview was done before Game 4] it is extremely tough. I do hope though that Ilya [Kovalchuk] will win his first Stanley Cup. But I think it will be too difficult and they don't have a lot of chances." How do you feel about stiffer penalties for head shots in the NHL? "It is very difficult to change the rules very drastically. Of course in some situations you want penalties to be stiffer, tougher suspensions not for 2-3 games, but for 5-6 because it does affect the guilty player. You can even take a look at our team and how Matt Cooke used to play when he injured players often and he got suspended. But this year he completely changed his game and got only about 30 penalty minutes. When you suspend a player for 10 games or so including the playoffs it will make that player think. Especially when the money is taken out of your pay it does affect you. There are so many injuries, especially this season. And of course the League needs to make changes to the rules and take steps to increase suspensions." What are your thoughts on Alexander Radulov and what advice would you give him: stay in the NHL or go back to the KHL? "It is difficult for me to say because I don't know the situation he is in. But if I were in his shoes, I would stay in the NHL and prove to everyone that I am an excellent player. I'd want to show that Nashville made a big mistake by trading me. I'd prepare for the next season the best I can and would become one of the best players and people would look at me differently. Because all of the words I hear about him is unfounded criticism. But it is difficult for me to judge. If he chooses the KHL, then it is his way, but even in the KHL he would have to prove he is the best."